Looking to add an outdoor living area to enjoy during the warmer months? Consider a custom-designed deck from the team at Monk’s Home Improvements. Imagine the possibilities. Our expert craftsman will help you design the perfect outdoor space for your lifestyle. With available options such as fireplaces, outdoor kitchens, built-in seating, and integrating lighting, our outdoor deck designs will transform your backyard into an oasis of family fun. 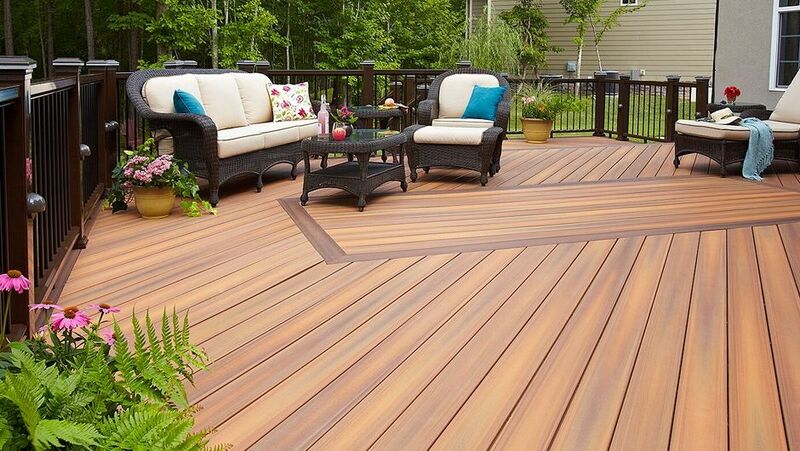 We build new decks from pressure-treated wood, as well as low maintenance composite material. 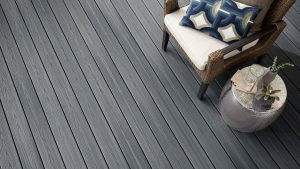 In fact, we sell composite decking through our two showrooms. This way, we can offer you a full-service solution to make your new outdoor project come together smoothly and easily. 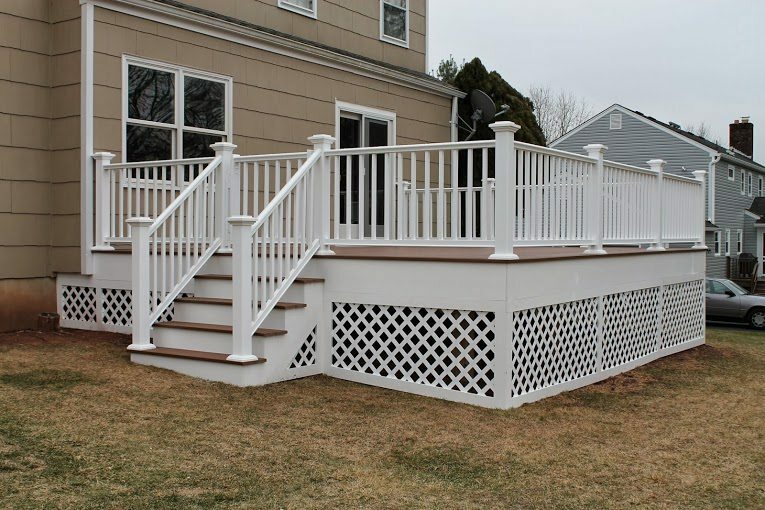 In addition to designing and building brand new decks, we also provide refacing and repairing. Refacing (or resurfacing) involves having us remove the floorboards, treads, and railings. These components are typically made of pressure-treated wood. We replace all of these components with composite material to provide a long-lasting, maintenance-free structure. Since the structural components remain intact, there isn’t a need for a permit. With natural wood decks and porches, it is necessary to continually repair and maintain the structures. We can make any necessary repairs such as replacing rotted floorboards or railings. We also pressure wash and stain or paint, and seal. We prefer to build or re-face existing decks with composite decking. Made of a mix of waste wood or cellulose fiber and plastic, composite decking lasts much longer than pressure-treated wood while requiring far less maintenance. In addition, composite won’t splinter or crack, so it’s safer for pets and bare feet. Perhaps best of all, composites are eco-friendly. They do not contain the toxic chemicals often found in pressure-treated lumber. Fiberon composite is made from locally-sourced recycled plastic and lumber mill scraps, preventing tons of plastic from heading to the landfill. We work with different brands, but Fiberon is our brand of choice. Fiberon is an affordable composite which is manufactured here in the U.S.A. In business since 1997, nearly all of their products come with a 25 year “no fade, no stain” warranty. Our showroom representatives will explain to you the different product types and show you samples of the colors and textures. After installing a composite deck and railing system, you should expect to lightly powerwash it every couple of years. That’s it! No painting, sealing or replacing rotted boards. The only drawback to composite decking is that it does get hotter than wood when it sits in the sun. So if your deck is exposed to full sun for many hours each day, we recommend choosing a light color for the flooring. 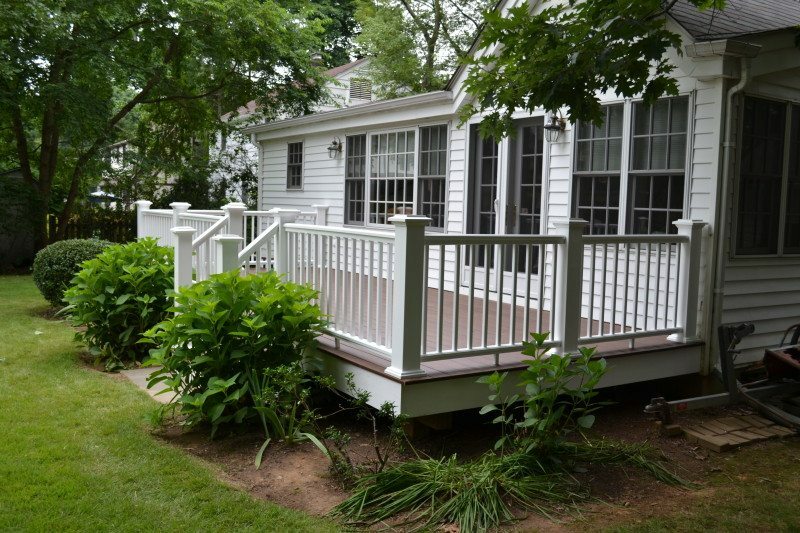 If you’re ready to build the deck or family outdoor area you’ve always wanted, contact us at 973-635-7900 today. 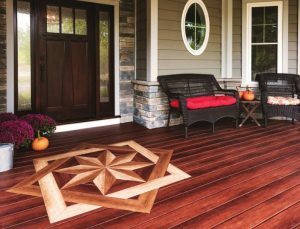 We’ll give you a free estimate for a new deck, refacing with composite, repairs, staining or painting, or pressure washing anywhere in northern New Jersey. Also, see our Deck Photo Gallery to see projects completed by Monk’s carpenters. Travis and his carpenters did a fantastic two phase job freeing my in deck spa so it could be removed for repairs, and then replacing the area surrounding the spa when it was repaired and returned three months later. They replaced the deck with screws in the event it must be taken up again in the future. Completely satisfied. Professional all the way. We'll come to your home, take measurements, discuss the design and material options. You'll receive a detailed, written estimate.